"Each finished piece is informed by fieldwork, which enables me to embed the subject in my mind’s eye"
Based south of Belfast in Northern Ireland, Adele Pound was always instinctively drawn to wildlife art. Located on the inner side of Strangford Lough, Adele is based in the Ards and North Down Borough Council area, about ten miles from Belfast. She’s a keen birdwatcher and has been involved with a number of local groups through the years. Inspired by this long-standing interest, a theme Adele is currently exploring is migration. Adele explains: “Migrating birds…connect us right across the world. 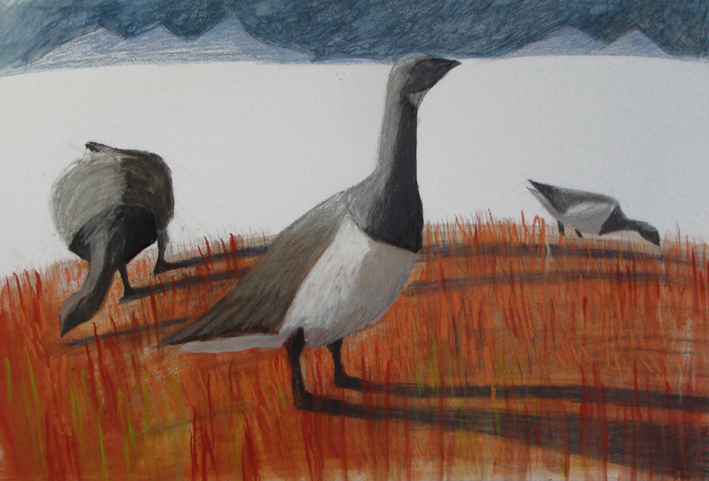 The Brent geese, they come so far, over the Greenland icecap and down to Iceland. My swallows are someone in Africa’s swallows through the winter…something very local can connect you to far-flung places”. It was in Winchester School of Art in England that Adele first studied art, but she is still constantly learning. This has included being part of ‘Craft Tech’ workshops at FabLabs in Belfast, as well as completing a comic book illustration course. Both have influenced Adele’s work. 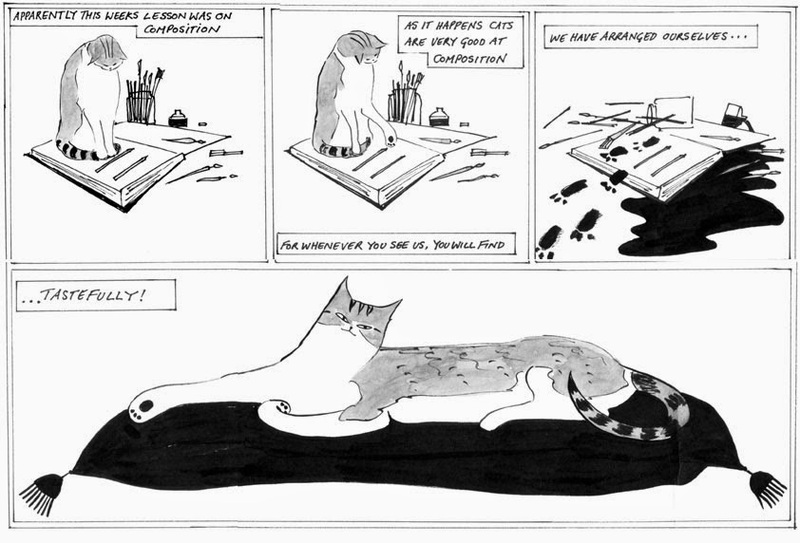 Seeing the world from an animal’s point of view inspired ‘Health and Safety Cat’, which has a life through Adele’s blog and also had its own graphic story for a period. One of Adele’s craft products are hand-made bird-shaped cards sold through the Craft and Design Collective’s retail arm ‘Space Craft’ in Belfast. She thinks using a laser cutter to assist with cutting shapes could help make the whole process more efficient, a technique she learned about through FabLabs. Adele has taken up a number of residencies as part of her art practice. Next February she will spend two weeks at Ballinglen Arts Foundation in County Mayo. Each year Ards and North Down Borough Council award a bursary to a local artist and Adele succeeded in obtaining the award this year. She notes the importance of support she has received through the years. This has come from a range of sources, such as Ards and North Down Borough Council and Arts Council Northern Ireland. Adele proactively seeks out information on supports for artists and calls for exhibitions. Planning and setting time aside to make an application is also important, but it’s a balancing act, according to Adele: “I try to be quite proactive about planning and thinking okay what did I see last year, what was the deadline, can I find out when this year’s deadline is so that I know ahead of time when to expect to see that call… but you have to balance producing the work with keeping an eye on what might come up”. Alongside this, she also fits in part-time work with a Belfast-based charity where she’s worked for the past 17 years. Another residency Adele was a part of was with the Copeland Island Bird Observatory. This brought a group of twelve artists together for a weekend residency on the Copeland Islands and three exhibitions emerged from it. Normally only members of the Copeland Island Bird Observatory get the opportunity to stay overnight on the islands. The residency provided the chance for artists to observe its wildlife from morning until night. This brought experiences only a select few normally get a chance to observe. Adele says “We got to see Manx Shearwaters coming in to stay at night, which you wouldn’t do if you just went on a day trip”.